WASHINGTON — The Obama administration says too many minority students are being singled out for special education and is asking states to address the issue. With new data in hand, the Education Department said Tuesday that disparities persist in the nation’s public schools, where oftentimes minority students are more likely to be identified as having a disability and face harsher discipline than their white counterparts. It is “something we can and must fix,” he said. The department is proposing a new rule with two key parts. States would be required to adopt a standard approach to compare racial and ethnic groups and determine when disparities are significant. Basically, it calls for a uniform way to measure when there’s an overrepresentation of minority students in special education. Once overrepresentation is identified in a district, school officials would have more flexibility under the proposed rule in how they spend their federal dollars allocated under the Individuals with Disabilities Education Act, or IDEA. Currently, when a district is tagged as having significant disparities, it must set aside 15 percent of its IDEA money to provide early intervening services, beginning in kindergarten. The proposed rule would broaden that and include services to students with and without disabilities, beginning in preschool. The department said a new analysis of data submitted by the states shows hundreds of districts around the country with large racial and ethnic disparities go unidentified. For example, the analysis showed 876 school districts gave African American students with disabilities short-term, out-of-school suspensions at least twice as often as all other students with disabilities for three years in a row. But, in 2013, the department said states identified fewer than 500 districts in total with “significant disproportionality” or overrepresentation. King said studies have shown that only between 2 percent and 3 percent of all school districts nationwide have been identified as such. The department analysis of state data, he said, showed that in Pennsylvania, 13 districts identified Hispanic students with speech or language impairments at least twice as often as all other students for three consecutive years, beginning in 2012. Yet, King said, Pennsylvania did not find any districts as having a wide disparity in the identification of specific disabilities in the 2012-13 school year. 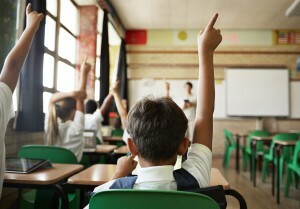 Tuesday’s proposal of a new rule follows a 2013 report from the Government Accountability Office that concluded that the way some states defined overrepresentation made it unlikely that any local districts would be identified as having significant disparities and then be required to spend money on intervening and support services for students. The report called for a standard approach for defining when there were sharp disparities to be used by all states. The proposed rule will be open to public comment. It’s expected to take months before a final rule is issued.